The demo of Jason Robert’s Gorogoa was one of the few games I was willing to suffer through playing on my new laptop about two years ago, and I’d been eagerly awaiting the full release ever since. I heard that he scrapped a lot of his original ideas, though, for a more streamlined approach, and I wasn’t sure what that meant and whether the game would still resemble the demo I played. Thankfully, Gorogoa far surpassed all my expectations and is a strong contender for my personal Game of the Year. I don’t know how I can possibly do the game justice explaining its mechanics with words, but since this is a review, I’ll have to do my best. 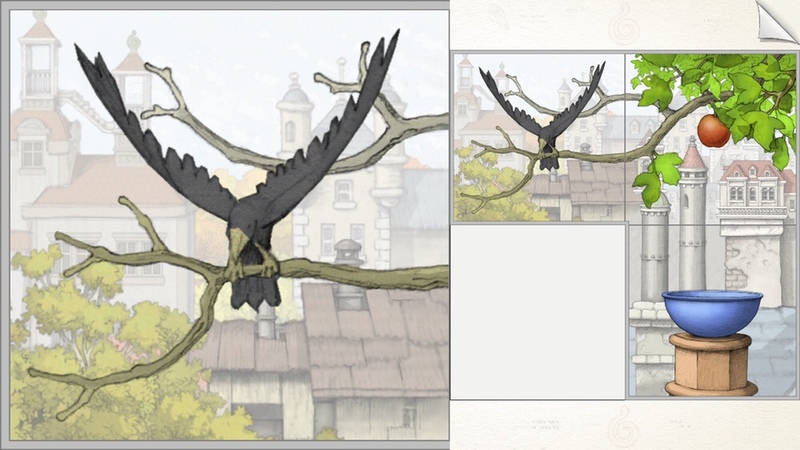 The way Gorogoa works is the screen is split into four sections. At any one time, it can hold up to four hand-drawn panels. If you’re playing on a touchscreen, interacting with it is as simple as using your finger to drag a panel to a different section of the screen. If you’re familiar with Loveshack’s FRAMED series, it’s a lot like that. But it goes much deeper. Besides dragging the panels around, you can interact with each of them in other ways. There are hot spots that let you zoom in to a smaller detail in a scene, usually revealing new areas to interact with. So when you tap on a faint building in the background, you’ll zoom in on the scene to see the building in all its detail. When available, you can also tap arrow icons to move up, down, left or right on a panel. So heading down from some clouds might land you on a mountaintop. But that’s not all. When you zoom out, you may discover a bigger scene encompassing the smaller one, expanding farther and farther out until what you thought was everything instead becomes a speck in the distance. 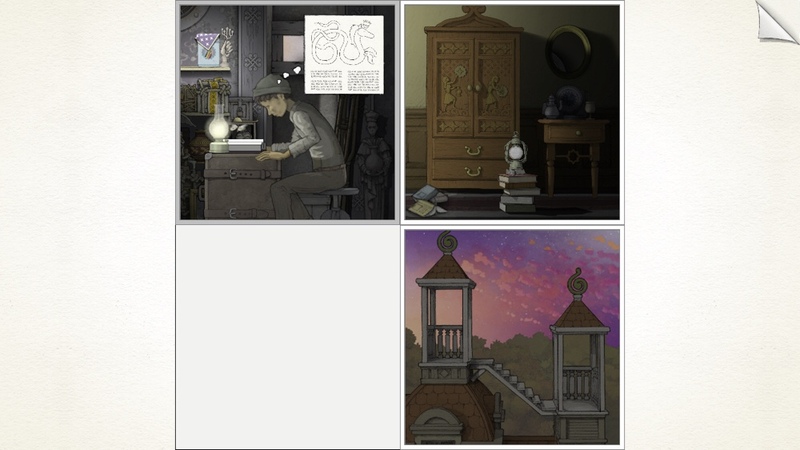 Often, the puzzles also involve finding the perspectives of two different panels that can fit together, so the protagonist can move between them. Sometimes you’ll move a panel and discover a new one hiding behind it. Similarly, a panel might have a cutout or window that can be placed over another panel so the two can combine. For example, you might need to overlap two doorways to enable travel between the panels. Or use the light source in one panel to ignite a lantern in another. Meanwhile, there are animations that blend seamlessly with all the mechanics. You can even interact with one panel while a different one has some action that’s still playing out. There’s lots more to discover, but like I said, describing it doesn’t do it justice. I also don’t want to spoil any of the the truly surprising elements so you can, well, be surprised by them. I’m still sorting through the story in my mind and may need to play through the game a few more times in order to truly make sense of it. Without any words, there’s definitely a lot of room for interpretation. But there is a clear goal and a sense of symmetry to it. The game starts off with a strange but beautiful monster stomping through the streets. You play as a young boy (or at least you help guide him on his journey) as he learns that he needs to collect five different colored fruits. Each chapter ends when he collects a fruit, so you’re not just aimlessly wandering around, solving puzzles. You know what the ultimate goal is. Early on, the chapters are fairly simple and I was worried I’d be through with the game too quickly, since I could see how far along I was based on the fruits I had already. But on the third chapter, everything gets far more complex and clever. Even though it’s not a long game once you know all the solutions, it took me several hours to get through it the first time without any help. Each chapter throws new surprises at you that will force you to think in new and creative ways. But it also feels fair, as clues can usually be found in the form of simple pencil sketches if you pay close attention. 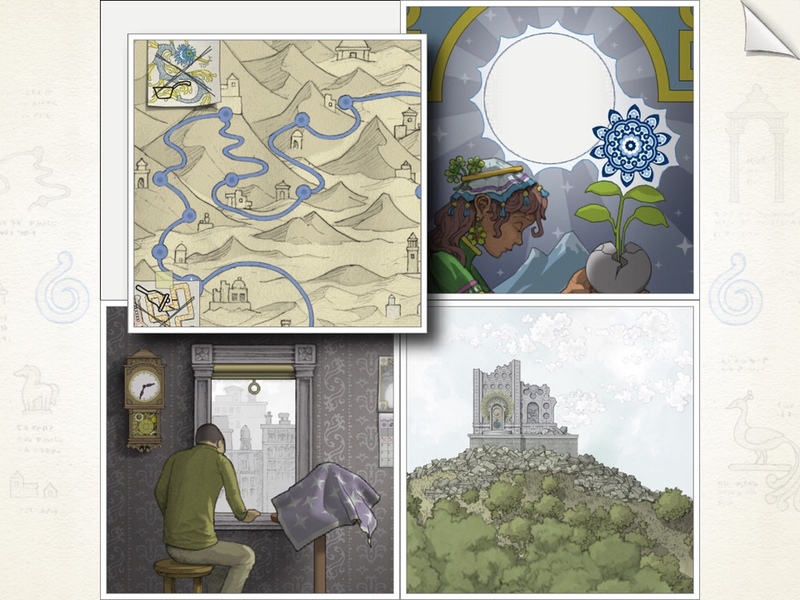 Gorogoa manages to do what so few games can — it’s a work of art, it’s accessible, but it also offers enough of a challenge so it doesn’t feel like the game is playing itself. 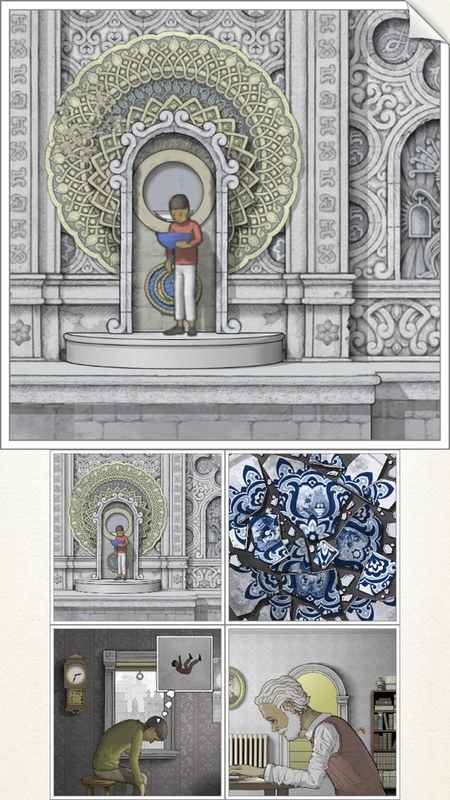 Like Monument Valley, Vignettes, FRAMED, and Splitter Critters before it, Gorogoa evokes a sense of awe, as though it was created not through coding, but through magic. And Gorogoa goes beyond these other games by using this magic so elegantly that it’s in a class of its own. The puzzles and mechanics are clever enough that they would have been fine without the hand-drawn artwork, just as the artwork would have been great on its own. But neither of those alone would have made for a must-have game. The way the two work together so seamlessly and effortlessly is what makes every second playing the game sheer delight. And on top of all that, there’s a beautifully eerie soundtrack to tie the whole package together. Now, since this is a cross-platform game, let’s talk about the touch controls. The iOS version is everything I could have hoped for. When I played the PC demo, I had some concerns about how it might translate to touch controls, since you would run your mouse over things to find hot spots, similar to a point-and-click adventure. Well, I think they did a fantastic job with it. On iOS, the default is that hot spots pulsate when you tap the screen. You might think this would make the game too easy, but that shouldn’t be a concern at all. Like the best adventure games, it’s all about solving puzzles, not pixel hunting. I prefer playing with the hot spot locator on, but if you’d like a more challenging experience that includes pixel hunting, you can turn it off in the settings. On top of that, the game has iCloud sync and plays in either portrait or landscape mode on both iPhone and iPad. Since the play area is made up of a square, it makes perfect sense to do it this way and I’m so glad they took advantage of it. Not only that, but on iPhone, since things are smaller, you can double-tap a single panel to zoom in on it. This feature works great and makes for a much more enjoyable experience on the small screen. And the game just plays so well with one hand. I still prefer my big iPad screen, but it’s a pleasure to play on my iPhone when I’m on the go. Someone worked hard to *edit* something down to make sure it's all killer and no filler and you *complain about that*? I don't want sawdust in my sausage. 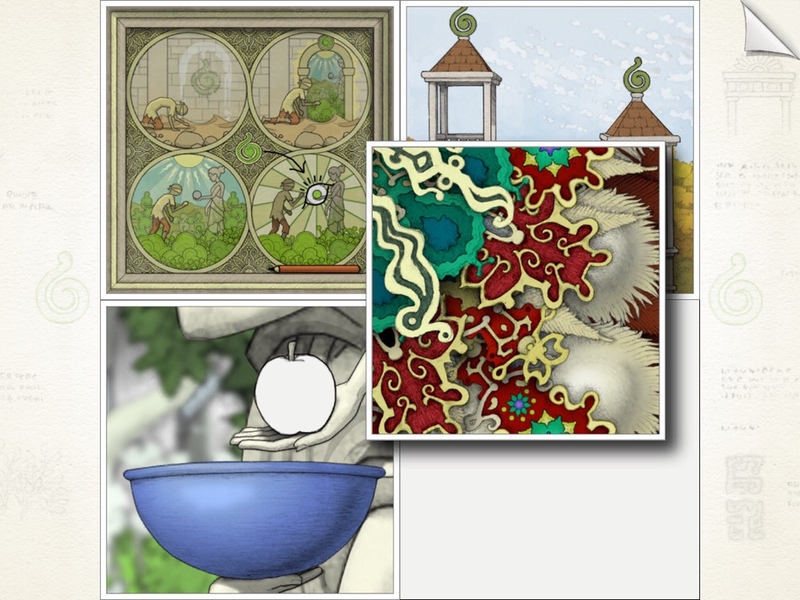 I really don’t know what else to say to convince you to play Gorogoa. It shouldn’t even really need convincing if you just look at some screenshots and GIFs to see the game in action. This is one of those rare essential games that needs to be in every person’s library, gamer or not. So what are you waiting for? Grab the game here and start your magical journey. And if you get stuck, try my walkthrough guide. Why is this so small on my iphone xr (about the size of a quarter)? I can play. Even when four squares a showing each one is still too small. You can double-tap on a square to zoom in. I meant to say I CANNOT play!